Beef and Tomato Skillet with Polenta is an easy one-skillet meal full of juicy ground chuck, cheese, and tomatoes baked on top of the creamiest polenta imaginable. It’s a winner, winner, ground beef dinner! 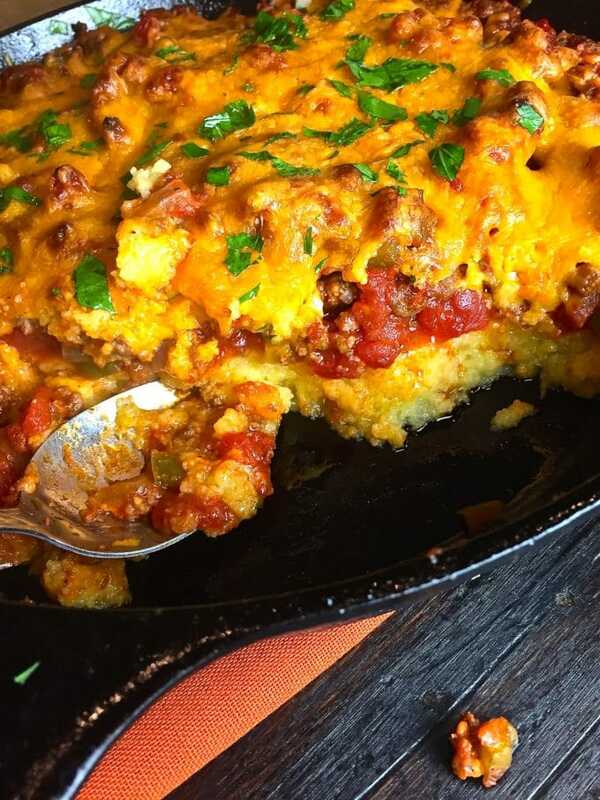 If you are looking for an easy one-skillet meal full of juicy ground chuck, cheese, and more cheese, and healthy and delicious tomatoes all combined and baked on top of the creamiest polenta imaginable, you are in the right place. I have to admit I haven’t used polenta in many of my recipes. I’m not sure why because I always love it when I eat in a restaurant. I guess maybe I thought it might be too complicated or time-consuming to cook. Well, I couldn’t have been more wrong! If polenta is something you are not familiar with or just aren’t too sure about, you have to check out this recipe. 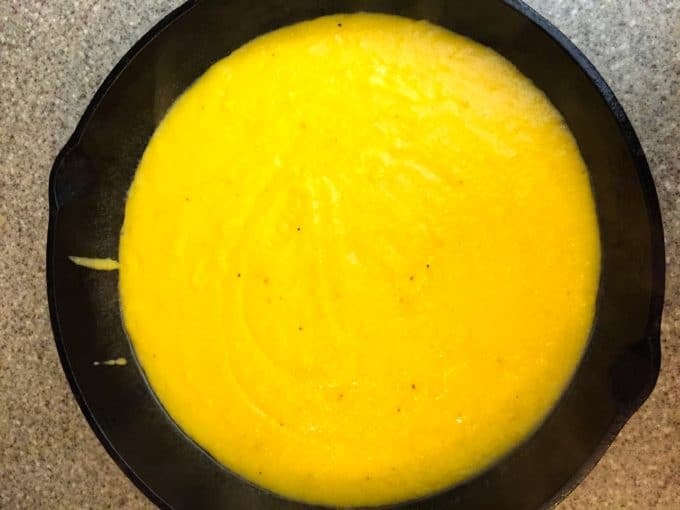 The polenta in this recipe, which is just yellow cornmeal cooked in water until it’s thickened, only takes three minutes to cook. Yes, you read that right! Normally polenta takes about 30-40 minutes to cook, but because this dish finishes cooking in the oven, the polenta finishes cooking at the same time as the rest of the dish. 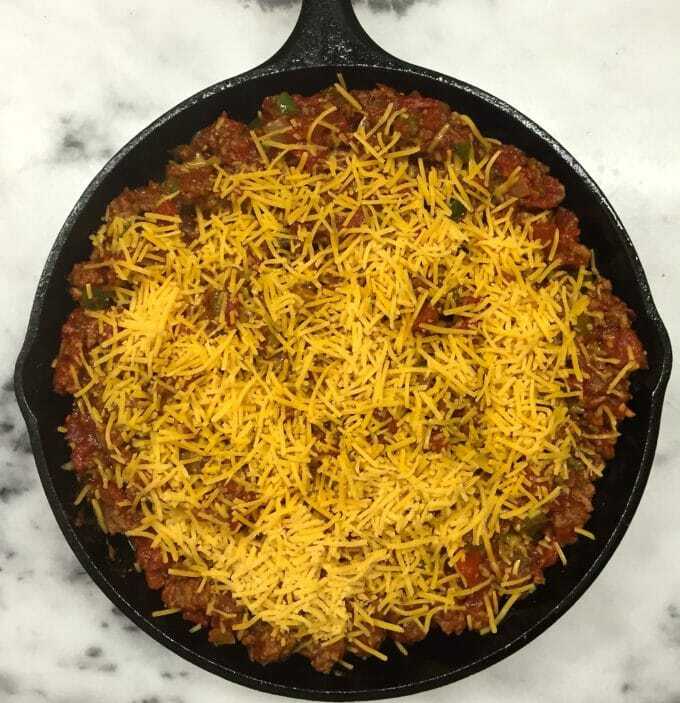 The combination of flavors and different textures in Beef and Tomato Skillet make it unique, and it’s one of my husband’s favorites! 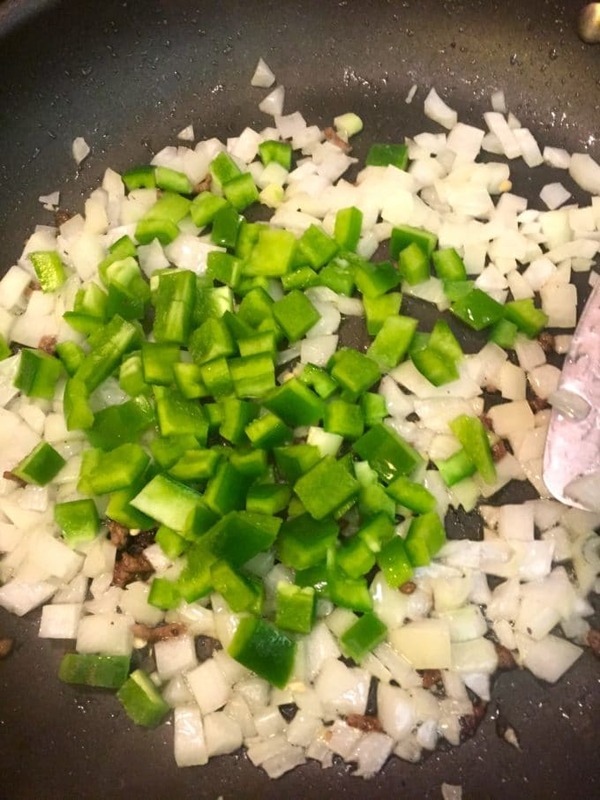 Try it tonight, and I’ll bet it will become one of your family’s favorite meals too! 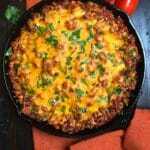 If you like recipes featuring ground beef, you might also like these recipes: Easy Cheesy Ground Beef Casserole, Beef Taco Salad, and Easy Make-Ahead Baked Ziti. 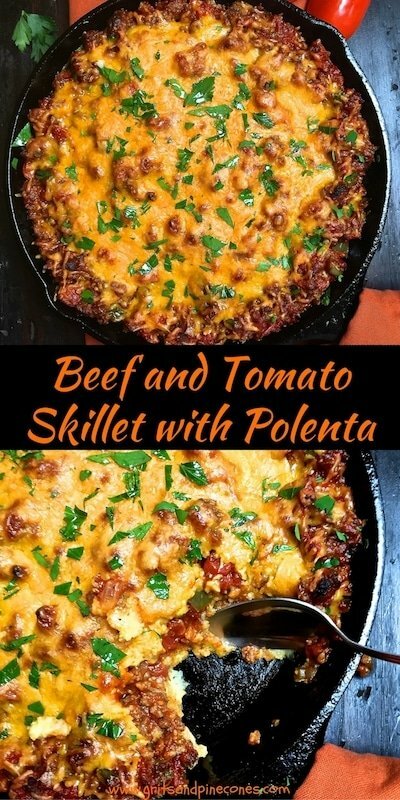 How to make Beef and Tomato Skillet with Polenta! If you are ready to make this delicious dish, gather your ingredients and preheat your oven to 350 degrees. Add 3 cups of water and 1 tsp salt to a large saucepan over medium-high heat. Bring to a boil and whisk in cornmeal. 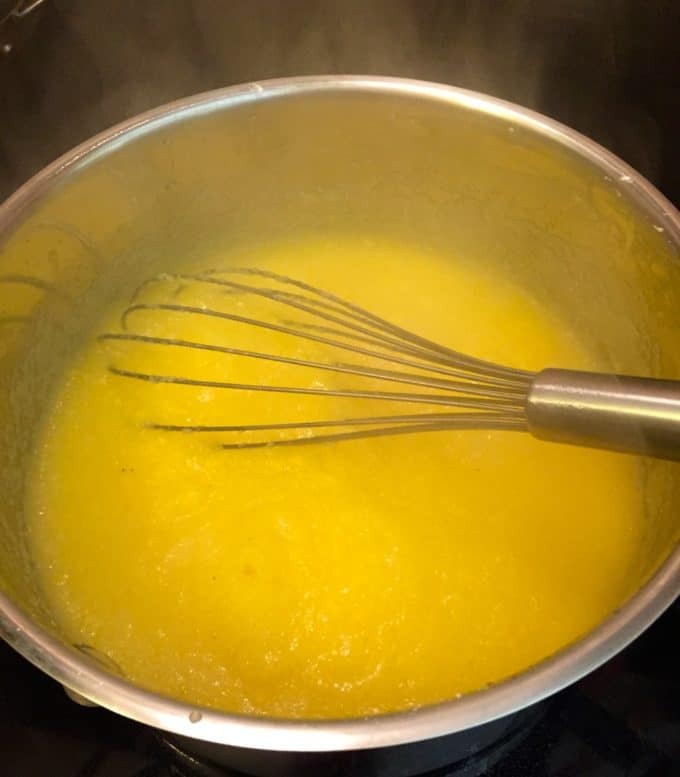 Reduce the heat to low and simmer, constantly whisking, 3 minutes or until thickened. Remove from the heat and stir in the Montreal seasoning and 1/4 cup cheddar cheese. Mix thoroughly. Pour the polenta into a greased 10-inch cast iron skillet and spread it evenly. Set aside. 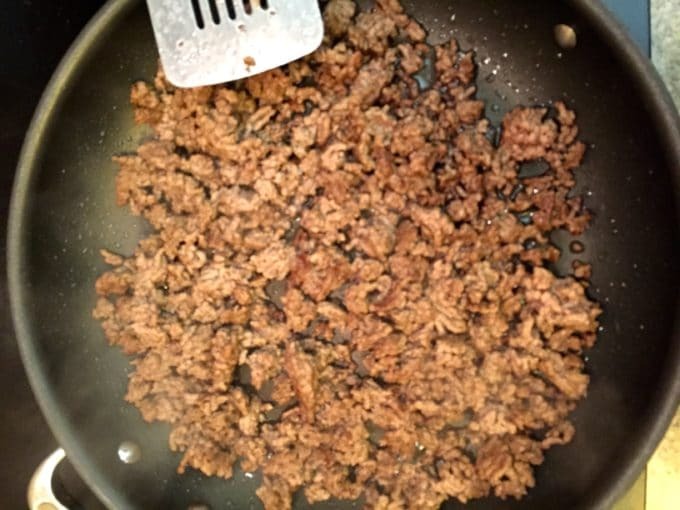 Brown the ground chuck in a large non-stick skillet over medium-high heat and cook for about 10 minutes, or until the meat is no longer pink. Drain and transfer to a bowl. Add the olive oil the skillet and saute the onions and bell pepper over medium heat for about 5 minutes. You want the vegetables to be tender but still somewhat crisp. 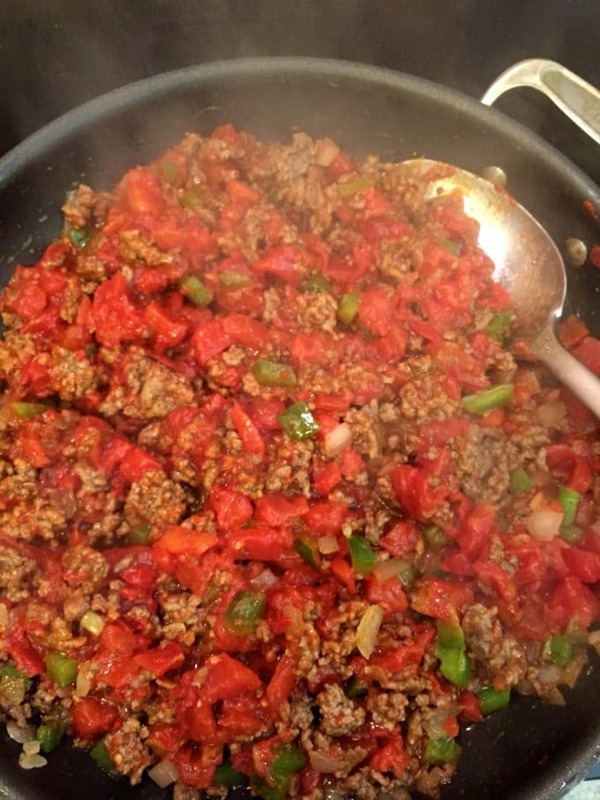 Add the ground beef back to the skillet as well as the tomatoes and tomato paste and mix well. Simmer for about 10 minutes. Pour the meat mixture evenly over the polenta and top with the remaining shredded cheese. Bake for 30 minutes or until bubbling and the cheese has melted. Garnish with parsley just before serving. Leftovers, if you have them will keep covered in the refrigerator for several days and are delicious heated up. If you liked the recipe above, please consider rating it and leaving a comment below. Also, follow me on Pinterest, Facebook, and Instagram. And finally, to be the first to receive notifications of new posts by email, enter your email address in the Subscribe box. Thank you so much for visiting Grits and Pinecones! 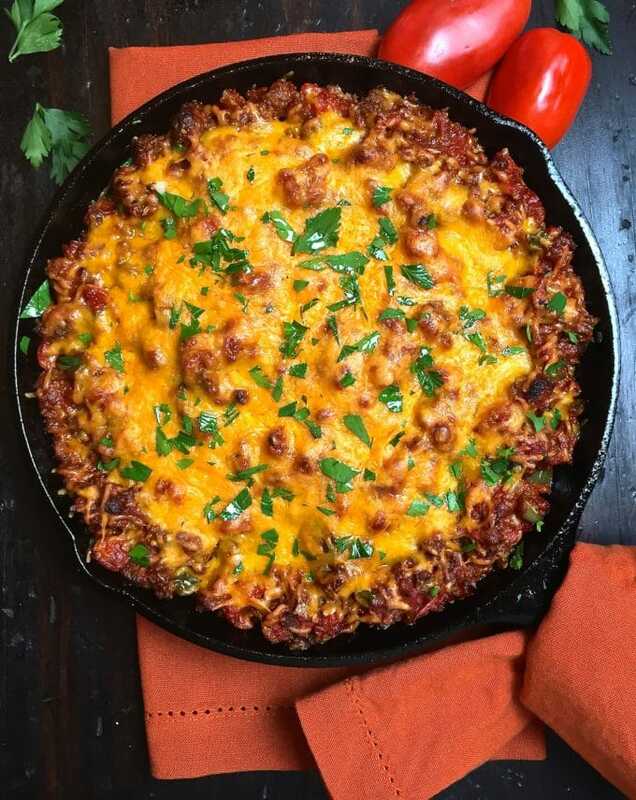 This is an easy one-skillet meal full of juicy ground chuck, cheese, and more cheese, and healthy and delicious tomatoes all combined and baked on top of the creamiest polenta imaginable. Add the olive oil the skillet and saute the onions and bell pepper over medium heat for about 5 minutes. You want the vegetables to be tender but still somewhat crisp. 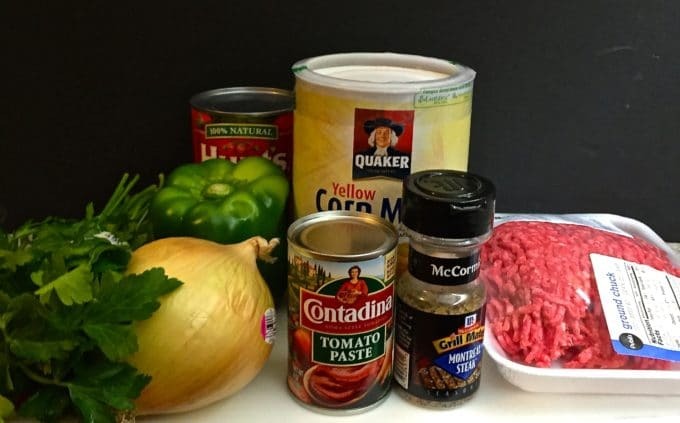 Add the ground beef back to the skillet as well as the tomatoes and tomato paste and mix well. Simmer for about 10 minutes. Leftovers if you have them will keep covered in the refrigerator for several days and are delicious heated up.